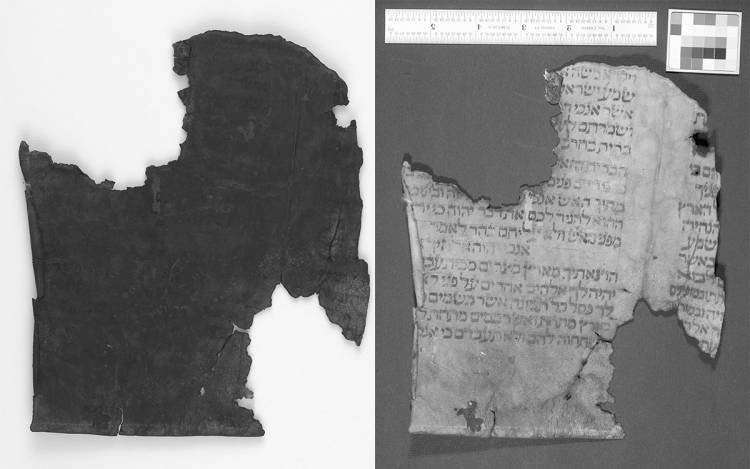 Multispectral imaging (MSI) can unveil text and images in decayed manuscripts that may be illegible to the naked eye. This tower flanked by lions is part of a smudged heraldic crest on the back cover of a copy of Pliny’s Natural History. In the Harry Potter series, a tap of the wand and a whispered incantation transforms a blank roll of parchment into detailed map of Hogwarts castle. 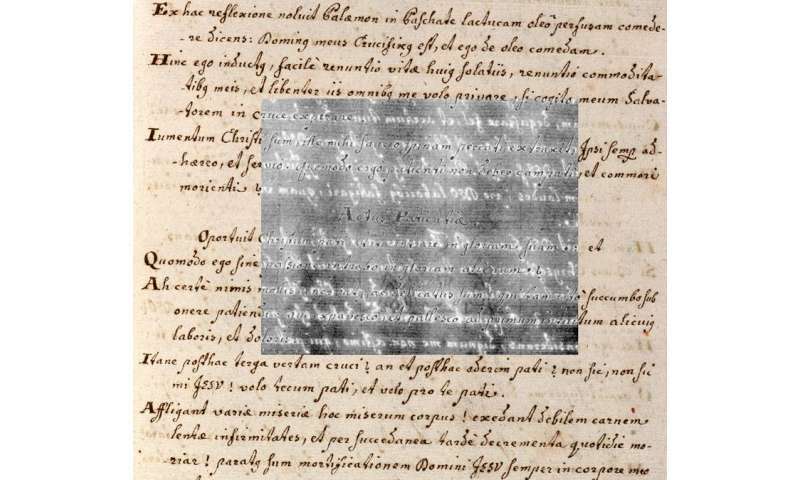 An imaging technique at the Duke Libraries, while perhaps not as efficient as a magic spell, has the same power to render hidden text visible once more. Multispectral imaging (MSI), captures images under different colors of light, eliciting details from texts that are imperceptible to the naked eye or a conventional high-resolution camera. Multispectral imaging is especially valuable to historians, archivists, and conservators, who are often faced with materials made illegible—or even invisible—by decay, erasure or reuse of materials. Under white or full-spectrum light, we see all the wavelengths reflecting from an object "smooshed together," said Mike Adamo, a digitization specialist at Duke Libraries. But MSI isolates the object's response from a single color at a time. Computer algorithms then search for differences between the individual images and combine them, pulling out subtle details that might be indiscernible under white light. "The algorithms enhance the subtle variations in how different regions of the object absorb and reflect color and bring them forward," Adamo said. "From that you might be able identify something that you are looking for." In one project, the team unearthed clues about the original owners of a rare copy of Pliny's Natural History, which is currently part of the collections at the Rubenstein Rare Book & Manuscript Library. "It's remarkable because it has these beautiful painted initial letters and title page, but it is also remarkable because of the way it was used in the Renaissance," said Andrew Armacost, head of collection development and curator of collections at the Rubenstein Library. "It has a lot of handwritten annotations in the pages, and someone compiled an index in the back before anyone had ever indexed this text." Armacost suspected that a smudged crest on the back cover could help solve the mystery of who composed these detailed notes. Under normal light, the crest is indecipherable—but MSI revealed an image of two lions flanking a castle tower. They hope this crest will help them identify the authors. "We have multiple police reports filed at different stages of the process, and we really wanted to know who they were writing to," said Josh Sosin, Director of the Libraries' Duke Collaboratory for Classics Computing and Associate Professor of Classical Studies. "That information can tell you a lot about the situation." "Ancient history is often detective work, where you try to reclaim one tiny bit of information in the hopes that that is going to be the bridge to some other tiny bit, which will open doors to three more tiny bits," Sosin said. "And if you are careful about this, and keep track of everything, you start to be able to build up a rich and full picture." "This brings a whole new capability into the library's quiver," Sosin said. "It gives us a new way to help researchers, and the joy of discovery that comes with it. And we do it in a very Duke way: working as a team across institutional and departmental boundaries to achieve more than any one of us could on our own!"